We had a spaceship in 1968. No, not Apollo. - Jason Alter Ph.D.
At one time Pan Am had a spaceship. Now I know if you were born in the early nineties or later, you may not even know what Pan American World Airways (Pan Am) was, but at one time Pan Am was one of the great American airlines. They even had a spaceship! Now Pan Am has been defunct since 1991, but in its time, it was at the top of the airline game. Back when air travel was fun. Yes, it was fun, and no, it’s not now. Believe someone who travels regularly. No more fun. The first time I saw a Pan Am spaceship, I was nine (1968), and I was in the Ziegfeld movie theater on West 54th street (Manhattan). I was watching Stanley Kubrick’s 2001: A Space Odyssey. My mind was blown. The movie was amazing, beautiful, inspiring, confusing. It launched the career of Douglas Trumbull, special effects wizard, who also worked on subsequent films and TV shows such as The Andromeda Strain, Battlestar Galactica (1977 version), Silent Running, Close Encounters of the 3rd kind and Star Trek: The Motion Picture. In the still famous opening scene, one of man’s early ancestors tosses a bone into the air, and it was transformed into a spaceship in earth orbit. The camera pans to the Earth and the Pan Am shuttle that sensuously approaches an orbiting space station. Of course, all carefully choreographed to Strauss’ Blue Danube. Seriously, if you haven’t seen it, watch it here on YouTube. It’s a beautiful sequence. The next time I saw the Pan Am spaceship (spaceplane) was in 1969 on my Moon Explorer Club card. 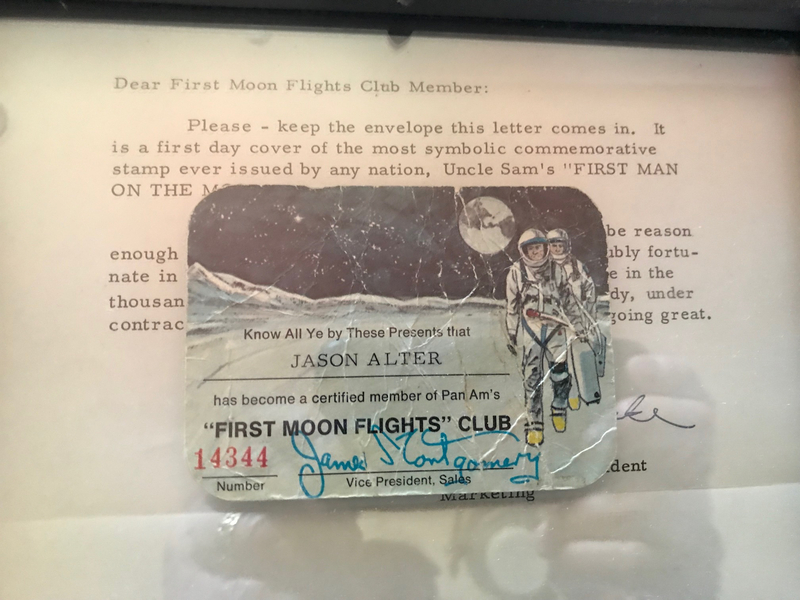 In 1969, the Pan Am Marketing Department had the brilliant idea of starting the “First Moon Flights Club.” Building on the success of the Apollo #8 and #10 flights, Pan AM issued approximately 93,000 club cards between 1968-1971. I was an early member, and this was my card. The cards are now collectibles, and the Smithsonian Air and Space Museum is looking for membership cards to be donated to their collections. Pan AM was surprised by the immediate interest and had to let their members know they had no idea how or when routine space flight would actually happen. However, they had captured the attention of my generation: the yearning for exploration, the desire for routine space flights to the moon and orbiting satellites, to one day colonize space starting with our own solar system. My early love for space travel and science fiction probably led to the outer space elements in the first John Fastramp race car adventure. What happened to that desire? To that will? It’s a big, complicated topic that deserves its own post. But, we can point to the familiar arguments: the $$ and where they might be put to better to use on Earth, the back and forth between manned versus robot spaceflight, but I believe, ultimately, too many of us became inwardly focused. We let our dreams lapse and went on with our lives. But, the good news – the excitement is coming back! There is renewed space enthusiasm in this generation. People like Elon Musk and Jeff Bezos leading companies like Space X and Blue Origin are making the stuff of science fiction reality. So, what happened to my card? I’m glad you asked. I recently gave it to my son who has always wanted to build rockets. Fresh out of school with a degree in mechanical engineering, he just started his career with Blue Origin. Passing the torch, er card, seemed exceptionally appropriate. How amazing. My childhood stories are coming to life. What a thrill to watch re-useable rockets land on fiery pillars! And to know that my kids will not only benefit, but they’ll also help lead the way. Pan Am might be gone, but spaceships are here to stay.